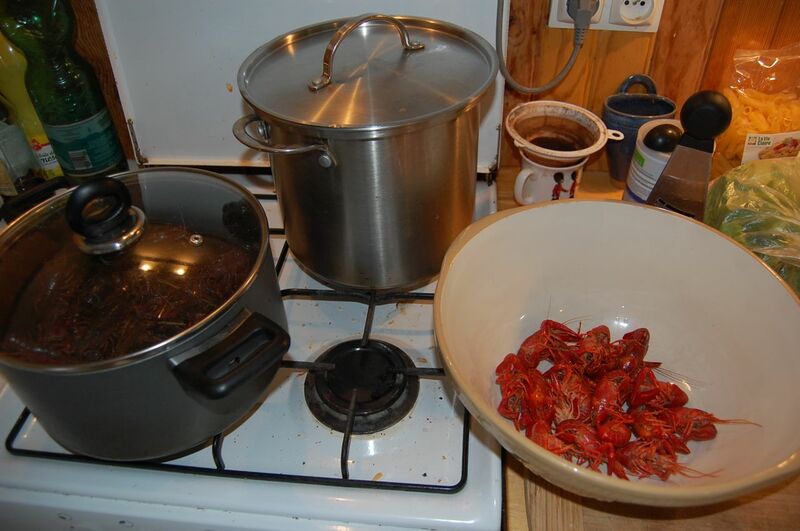 Last week, some of our guests spotted people pulling crayfish (US: crawfish) out of the lake in nearby Lanquais. So they went back, armed with a chicken drumstick and a bucket, and pulled out about 60 in a few minutes. Unfortunately for our guests, they went out for dinner that night, which meant we got to eat them all ourselves! Highly recommended – and many thanks to Tim, Janine and the boys for fishing them out for us. Here’s another suggestion for the recipe section of my never-to-be-written-or-read book entitled: “Embracing Austerity”. 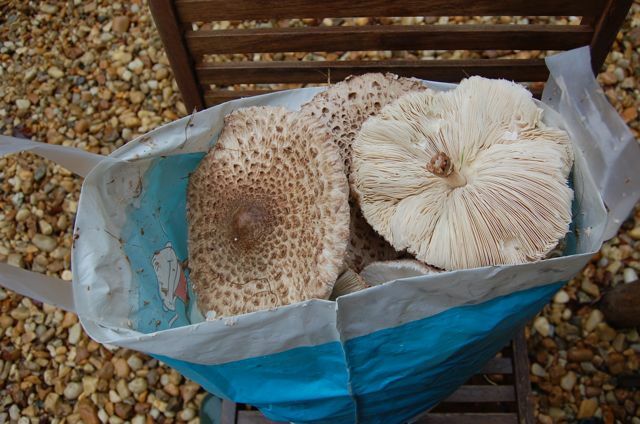 Take four parasol mushrooms from a nearby field (having checked to make sure they will not kill you), fry for a few minutes in shop-bought butter with home-grown garlic, add some home-grown chilli and a sprinkle of shop-bought mixed herbs, and season with shop-bought salt and pepper. Meanwhile bring a pan of utility company provided water to the boil, add a large pinch of salt and drop in some leftover home-made pasta. 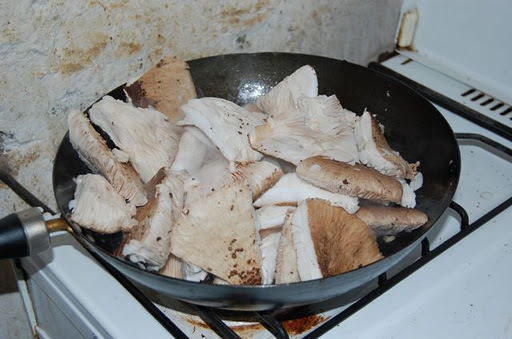 Boil for a few minutes, during which pour a little shop-bought cream into the mushrooms. We reckoned, excluding the cost of gas and lighting, each plate cost about 10 cents. Obviously, if you have a milk-producing animal you can make it for almost nothing. We’d have been happy to pay €8.95 in a restaurant – and would definitely have gone back. I forgot to mention this earlier. 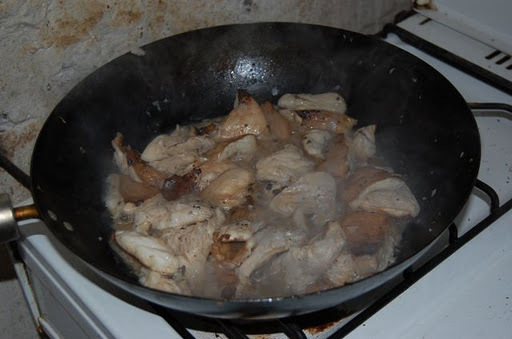 You must put a few drops of lemon juice in the sauce at the end of cooking. 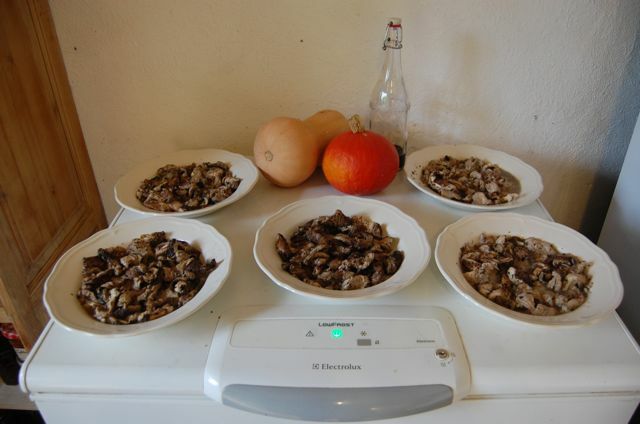 You won’t believe how much it brings out the taste of the mushrooms. There was a gunshot earlier, a bit close for comfort, so I went down the hill to see if I could catch myself a hunter. I didn’t see him (almost certainly a ‘him’), but I did find that Coulemelle season is upon us! 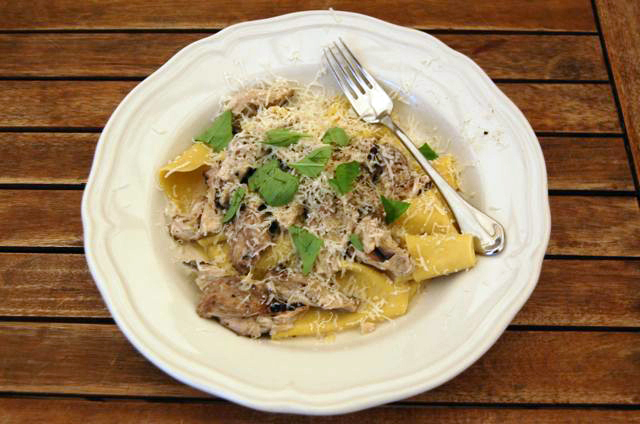 It takes a few minutes, costs almost nothing and tastes as good as it sounds. 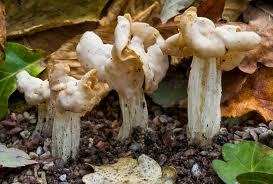 So our mushroom experiments began with the funky looking helvella crispa as described immediately below. Some time later, a trusted neighbour introduced us to the Coulemelle (Parasol Mushroom in English, macrolepiota procera in Biology) seen in a post well below that. 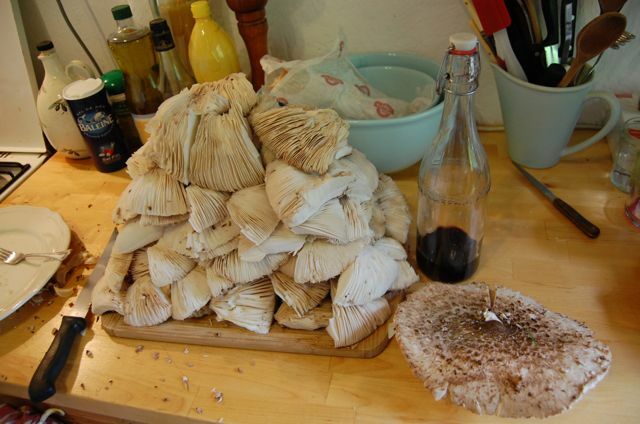 Then we tried the also-impossible-to-mistake coprinus comatus (Shaggy Ink Cap, Lawyer’s Wig or Shaggy Mane) and thought we were doing pretty well, adding one mushroom a year to our diet. 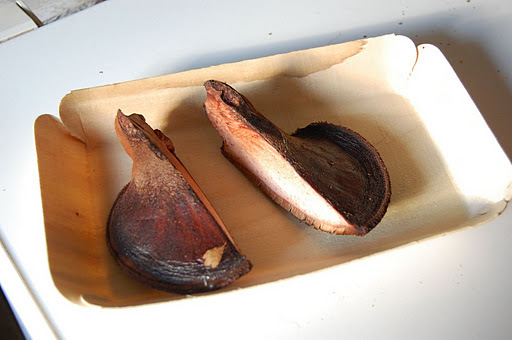 In English it’s called the Beefsteak Fungus (in French, the Beef Tongue, which looks more accurate and, in Latin, fistulina helpatica). Again we checked with our books and pharmacist and we were blessed with finding a textbook example to make it easier to swallow. I now check the base of every tree I pass on the off-chance I’ll spot another, which slows down my walks through the woods – another bonus. 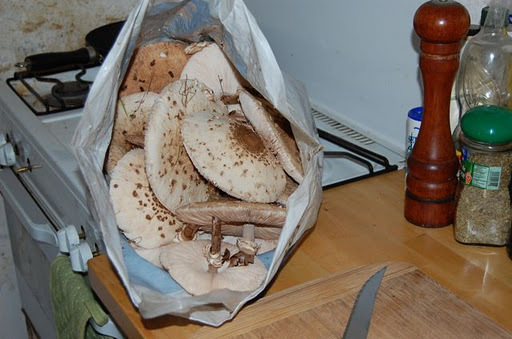 And a few weeks ago, a former neighbour told me about the rosé des prés (Field Mushroom in English, Meadow Mushroom in American, agaricus campestris in Latin) which immediately became Our Favourite Mushroom. A small one, freshly picked, entirely dominates whatever you put it in – and this morning I came back from feeding the animals with two, plus a half dozen Elfin Saddles. Got to love the rain. 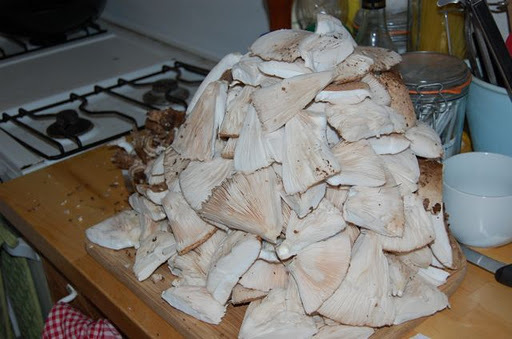 Eating foraged mushrooms is an unnerving experience – especially the first time – very especially when you have young children who couldn’t fend for themselves if you fell dead into your risotto. Which is why we only eat mushrooms that cannot be confused with anything else. It’s called Helvella crispa (or White Saddle, Elfin Saddle or Common Helvel for short) and is the wildest looking wild mushroom you’re ever likely to pick. 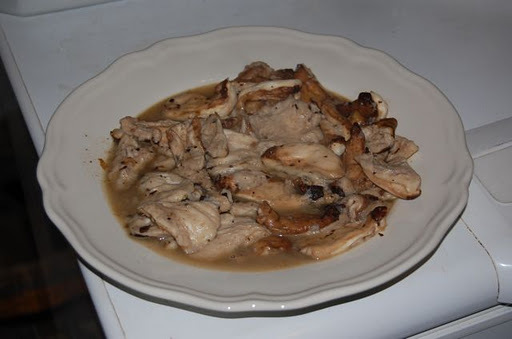 It can’t be eaten raw and is a bit of a pain to clean, but well worth the effort. It’s actually the first wild mushroom we ever ate. First we looked it up in two mushroom books, which are both in French to add room for error. Then we took it to a pharmacist trained to give safety advice on mushrooms, who didn’t recognise it (a bit of a worry there) and had to call us back to confirm its edibility (which is a word I’ve never written before). Finally we ate it, probably on toast with some cream – and lived to write the blog. Ever since, we’ve waited for it to appear on the same patch of drive, never knowing exactly when that will be. One year a wild boar got to them before we did (presumably the don’t-eat-raw law doesn’t apply to them) but yesterday I made a momentous discovery while chasing another hunting dog. There’s a second patch of them in the old pig area. Or at least there was until just before dinner last night. Yum. November 5th 2011 is Coulemelle Day. 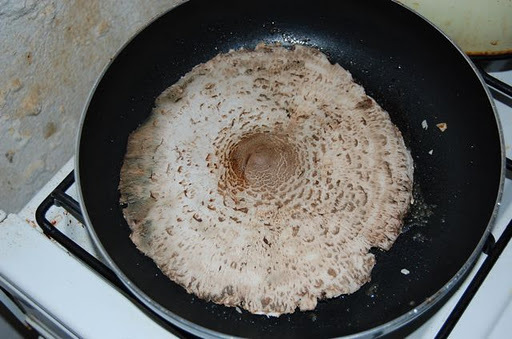 Coulemelle, also known as the Parasol Mushroom (Macrolepiota procera to Latin readers), is one of the few mushrooms we know we can eat. 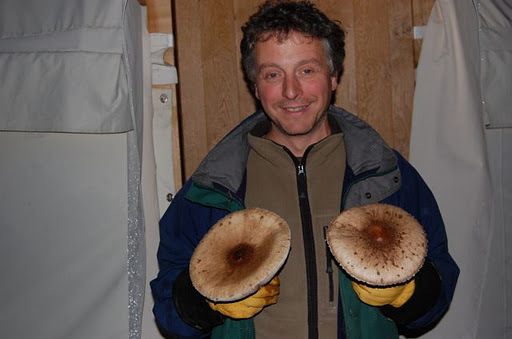 We were introduced to it by a neighbour a few years ago and, after checking two books and discovering it can’t be confused with other mushrooms due to its size, we look forward to it every year. Here’s a quick recipe to celebrate this year’s magical free food day, which will extend our enjoyment by three months (if we can leave them in the freezer that long).